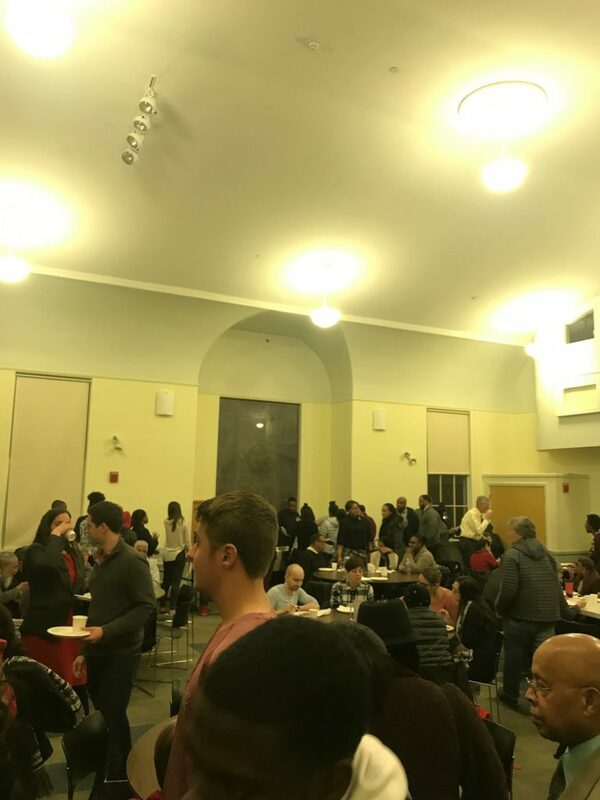 Last Tuesday night I, and many other people, attended an event entitled “The History of the Roxbury Defenders” at the First Church in Roxbury. 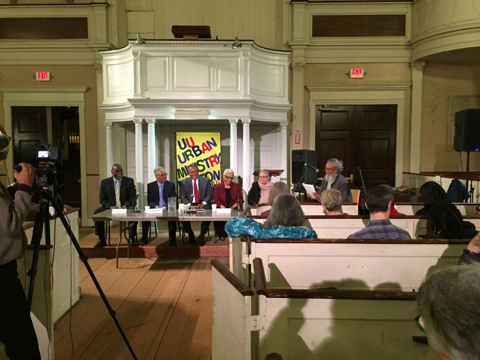 The event was cosponsored by the Roxbury Historical Society and the Unitarian Universalist Urban Ministry. It was great. 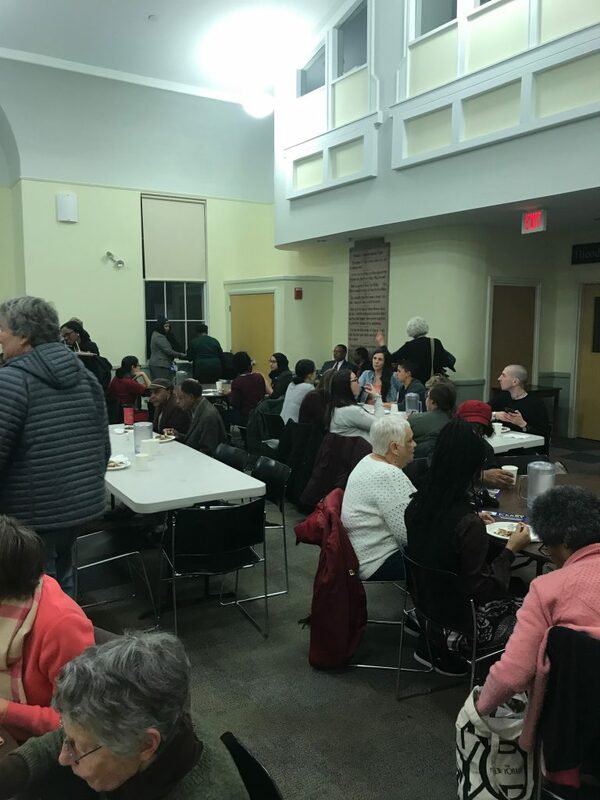 A group of four former Roxbury Defenders, and the current Roxbury Defender Attorney-in-Charge, spoke to a large group of neighborhood residents, and many CPCS people about their experiences as attorneys of color bringing equal justice and high quality legal services to an underserved community. The speakers were former SJC Chief Justice Roderick Ireland, former SJC Associate Justice, Geraldine Hines, former Roxbury District Court Presiding Justice, Milton Wright, former Boston Juvenile Court Justice Leslie Harris and current Attorney-in-Charge of the Roxbury Defenders, Yolanda Acevedo. The group was moderated by long-time State Representative, Byron Rushing. 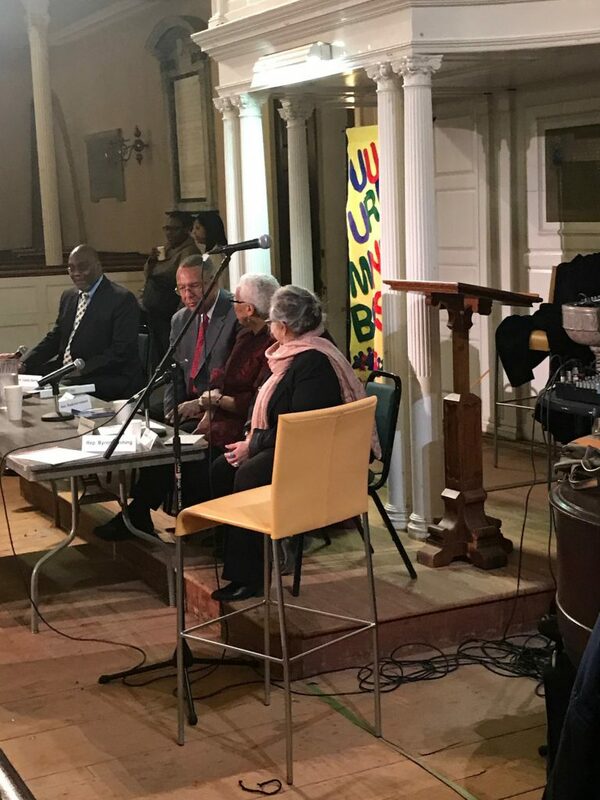 Each speaker told of their experiences that illuminated the depth of the struggle they faced and continue to face fighting for equal justice in their community. The history of the Roxbury Defenders is fascinating and inspiring. Former SJC Chief Justice Roderick Ireland spoke first. Justice Ireland was the first black person appointed to the Supreme Judicial Court in 1997, more than 300 years after the formation of the Court. The SJC was formed in 1692 as part of the charter for the Province of Massachusetts Bay. In 1971, when Ireland was twenty-seven years old, he and Wallace Sherwood formed the original Roxbury Defenders. At the time, people in Roxbury received legal representation in criminal cases from the Massachusetts Defenders Committee, but there was no permanent public defender office in Roxbury. The Roxbury Defenders office was the first. Sherwood and Ireland established the Roxbury Defenders in an energetic and inspired manner. They hired a small staff and set out to be pioneers and great lawyers. They challenged systemic issues. At the time, pre-trial court hearings were not recorded. Ireland and Sherwood brought a lawsuit, challenging the lack of recording. Although they did not win the case, their challenge was the first step towards the recording of all court proceedings. Also, at that time, judges could interrupt and stop probable cause hearings if they determined they had enough evidence for probable cause. These judicial interruptions often denied defense counsel the opportunity to complete cross-examination of prosecution witnesses or to present witnesses. The Roxbury Defenders challenged this practice as a violation of the defendant’s right to call his own witnesses and the SJC agreed. Aside from legal challenges, the early Roxbury Defenders sought to increase community awareness of legal issues. They produced a local radio show, called “Legal Line”, on which they answered questions from listeners and discussed topical legal issues. By the time Ireland left the Defenders in 1974, they had established a social services department and published a weekly newspaper. They were handling about 1500 cases a year and the office eventually grew to about 12 lawyers. Geraldine Hines and Margaret Burnham (first black woman judge in Massachusetts) were early staff attorneys. Geraldine Hines, who was the first black woman to serve on the Supreme Judicial Court, spoke about the struggle for black women attorneys in Boston in the early seventies. Justice Hines put it politely when she said: “there were cultural issues to fight through”. She was a Roxbury Defender in 1973 when she was sitting in a Roxbury courtroom, waiting to have her case called. She sat until her case was the only one that had not been called. The judge asked her: “Ms. Hines, are you a lawyer?” Hines replied: “I have sat here all day and you haven’t asked anyone else that question.” She refused to answer the question and the judge left the bench without calling her case. Milton Wright, another former Roxbury Defender, who went on to become the Presiding Justice in the Roxbury District Court, also spoke about the struggles he faced as a black attorney in Boston. Wright spoke about a time, in the early 80s, when he was working as a Roxbury Defender. He went up to the lock-up to see his client. He was blocked by a court officer, who asked: “Who are you?” He responded: “I’m Mr. Wright, who are you?” Wright, who is also a professional singer – he is known as the “singing judge” – always wanted to be an entertainer but said that nothing compared to being a Roxbury Defender. Leslie Harris, another Roxbury Defender, who became a juvenile judge, spoke about his path to the Roxbury Defenders. Harris started out as a grade school teacher in Boston and was inspired by Judge David Nelson, who was the first black person to be appointed to the federal bench in Massachusetts. He remembers Nelson urging teachers to become probation officers so they could assist underserved young people. Harris became a probation officer but was inspired by watching attorneys in court. He decided he wanted to become an attorney, specifically a Roxbury Defender. He went to law school and was soon hired as a Roxbury Defender. Yolanda Acevedo, the current Attorney-in-Charge of the Roxbury Defenders, spoke about her long career as a Roxbury Defender. Yolanda has been a Roxbury Defender since 1982; her entire legal career. She has been the Attorney-in-Charge for the last five years. 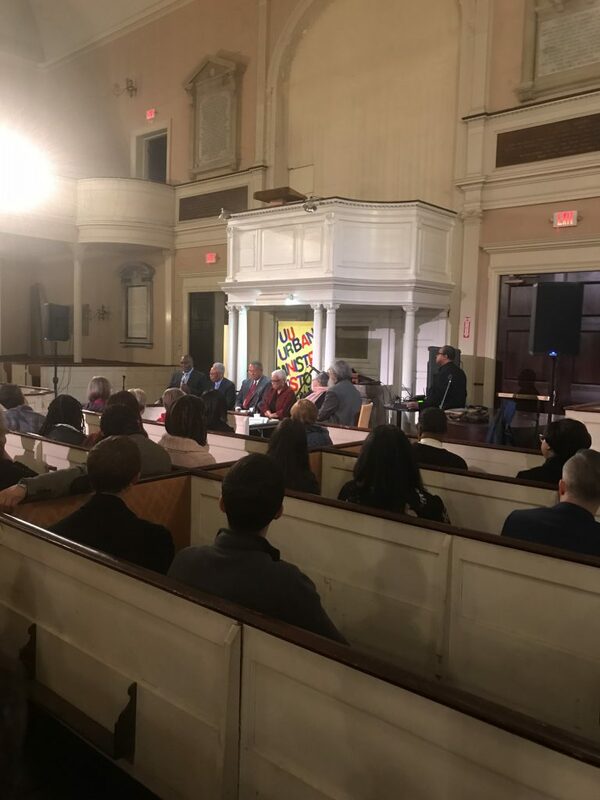 Yolanda spoke about the inspiration she has continuously received from the Roxbury Defenders, especially in her early days, when she worked with John Amabile – currently a preeminent private criminal defense attorney in Massachusetts – and Martha Reeves – currently a federal Administrative Law Judge. Yolanda also spoke of her struggle as a woman Hispanic attorney, recounting that she was asked if she was the court interpreter. As the evening began to wind down, moderator Byron Rushing stated that things had improved for poor black people in the criminal justice system. Justice Hines pushed back. She said racial disparity is still a major problem in the Massachusetts criminal justice system. She cited Massachusetts’ poor record of racial disparity in sentencing and the persistence of implicit bias in all aspects of the criminal justice system. Yolanda also mentioned the many injustices that continue, including the imposition of extraordinarily high bails that keep accused people locked up and the persistence of minimum mandatory sentences that prevent the client’s life story from being considered by the sentencing judge. This event drew a large group of people from the community and from CPCS. The Roxbury Defenders is an institution in Roxbury and is part of the proud history of CPCS and a tribute to its fight for equal justice. Here are some photographs from the event. This entry was posted in Criminal Defense and tagged Criminal Defense, Public Defenders, remembrance on February 22, 2018 by Randy Gioia. On February 13, 2018, Chief Counsel Anthony Benedetti testified before the Joint Ways and Means Committee at their annual budget hearing in Worcester. The written testimony that was submitted along with supporting documentation can be found here: W&M FY 2019 Written Testimony. This entry was posted in Chief Counsel's Office and tagged testimony on February 22, 2018 by dsimonini. The 6th day of the training on clinical aspects of mental health litigation is tentatively scheduled for May 18, 2018, location TBD. Applicants must be accepted before registering for the training. The deadline to apply is April 2, 2018. This entry was posted on February 21, 2018 by pmarie.